TVS Motors has launched this particular motorcycle as a celebration of success of Star City bikes with the incoming festivals. TVS Motor Company is expecting customers to purchase bikes like Star City Plus. 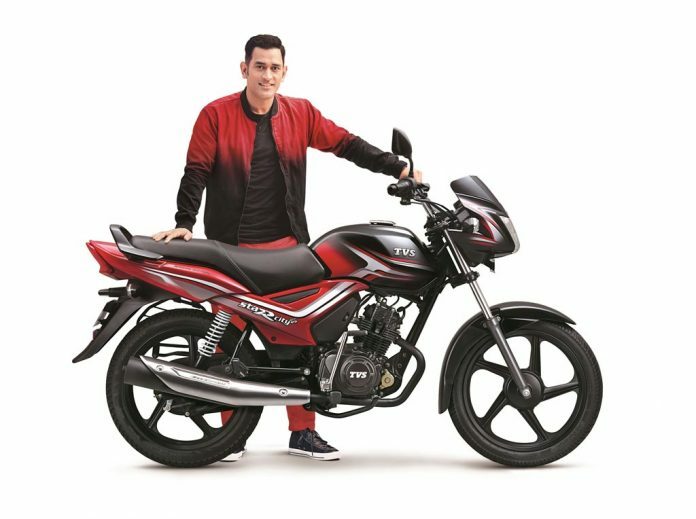 When it comes to technical specifications, the all new TVS Star City+ continues to be powered by 109.7 cc, one cylinder engine which is mated to a 4-speed manual transmission gearbox. Star City Plus’ engine manages to churn out a maximum power of 8.3bhp delivering a peak torque of 8.7 Nm. The all new TVS Star City+ gets 130 mm drum brakes in the front and 110 mm drum unit at the rear. The suspension consists of front telescopic forks and at the rear there is 5-step adjustable twin shock absorbers. The motorcycle runs on 2.75×17 front and 3.00×17 rear tyres and also gets a black alloy wheels. The Instrumental panel in the front of the new TVS Star City Plus is the same as that of standard version. The digital analog unit of Star City Plus shows the speed. The other features of TVS Star City+ include dual tone seat, 3D badging and a complete blacked out theme.